Can you imagine being the guy who wrote that Pasadena Star News article? You know, the one where Sho Tay purportedly stated that he never would apologize for fibbing on a campaign postcard because it would make the 60,000 Asians in Arcadia look like liars? Or some such rather whacked out nonsense? Here you had your big bonfire of a scoop, one that was going to send Arcadia into a political deep space orbit. Except apparently what Sho Tay said to you, the reporter, and what actually did happen once his mouth and a City Council microphone finally got together, were two very different things. Shorter version: The Pasadena Star News article was a bust. Sho Tay, especially after a Raymond Burr style cross examination by Attorney Tom Beck, apologized for his campaign transgressions. The result being Sho is now the Mayor of Arcadia. If you want to get an indication of just how sensitive certain troubled folks were about Sho Tay's apology last night, you need look no further than David Liu's rather bizarre two minutes at the podium. Hearing him try and explain how this apology was not really an apology was the schadenfreude highlight of the evening. Tip of the hat to outgoing Mayor Peter Amundson for what was quite an elegant move on the timing of public comment. By letting the concerned residents assembled know ahead of time that Sho Tay was about to be confirmed as Mayor defused some of the hot heads planning on sharing their shop worn conspiracy theories with the folks at home one more time. Who could possibly blame the outgoing Mayor. Would you have wanted to sit through an hour of that nonsense one more time? Mod: I asked now Mayor Pro Tem Verlato to review for us her FPPC situation. Here is what she sent in. 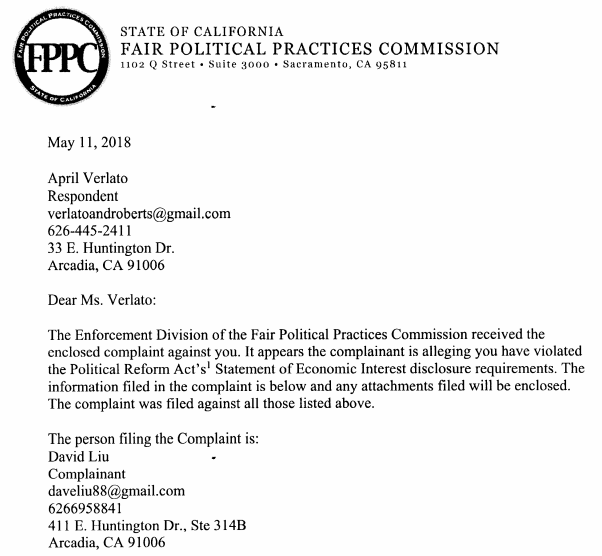 City Council has received many emails from residents in regards to an FPPC investigation that was opened against me for failing to report an ownership interest in a business in Arcadia. I wanted to publicly address this issue to clear up the facts surrounding this investigation. 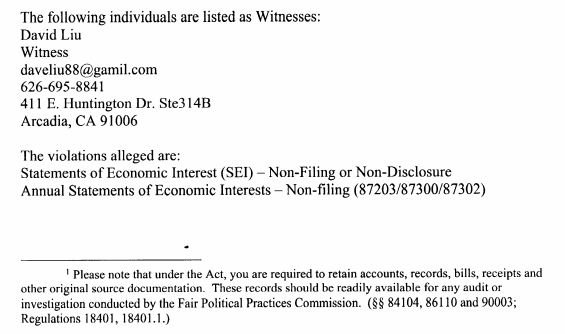 A Form 700 is a mandatory filing under the Fair Political Practices Act that is meant to disclose potential financial conflicts of interest an elected official may have in decisions that are before him or her. 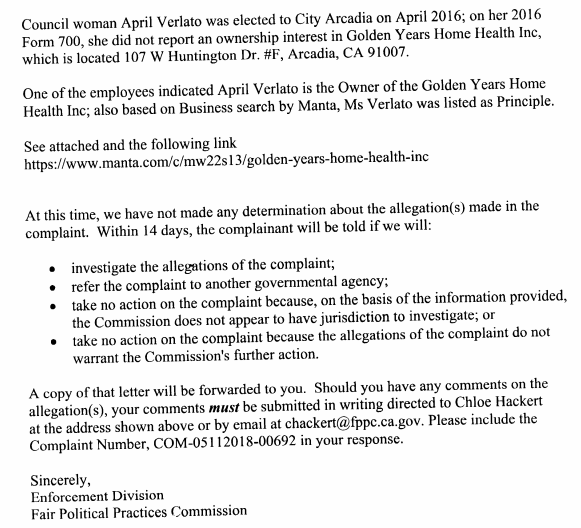 A complaint was filed by David Liu against me for an alleged ownership interest in a company doing business within the city limits of Arcadia. 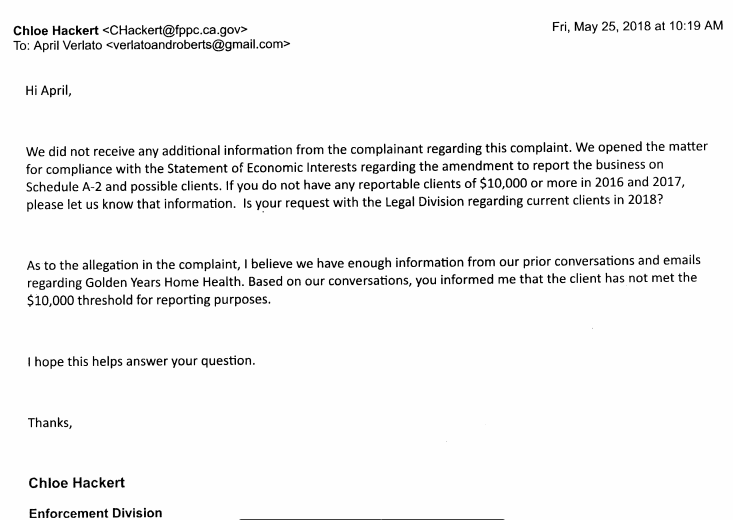 I’ve attached a copy of the email I received from the FPPC alerting me to this complaint. I do not have an ownership interest in this business. This business is a client. I am not required to report this relationship on the Form 700 as it is presumed that my financial interest in this business (my fees for services rendered to them) does not pose a financial conflict. In addition, there has never been a matter before City Council that involved this client. However, through the process of reviewing my Form 700 filings, and in speaking with the Enforcement Officer of the FPPC, I discovered that I may have been reporting my business on the wrong page of the form. The Enforcement Officer confirmed this and opened an investigation into my misreporting of my income. The email from the FPPC confirming is attached. As you can see from this email, I am being investigated for listing my business on Schedule C instead of Schedule A-2. It’s all the same information, just on a different page. I have been filing my Form 700s with our Deputy City Clerk since 2014, and had been reporting my income on Schedule C per her instruction. The Deputy City Clerk is the Filing Officer, and as the Filing Officer she was supposed to ensure the proper reporting. Not once did she review my Form 700 and alert me to the mistake. Sometimes we all make mistakes and I was willing to own up to it and correct it. I have amended all my schedules appropriately and I am awaiting a determination by the FPPC. Thank you for your continued support and I apologize for the reporting error. David Liu really needs some help in life. A good anger management coach would help. He is your police department volunteer. He has accessed to part of your personal information including Tom and April. Why would a volunteer have access to that kind of information? During the campaigning, David Liu posted the video of a Harbicht sign getting torn up, on Nextdoor. Not the appropriate post to put up on that site. Neighbors commented, David commented, and it got to the point where the whole post was taken down and David was blocked from Nextdoor. Neighbors who were not happy seeing a post like that on Nextdoor, left the site permanently. For someone who is a volunteer for our police department, and earned the most volunteer hours for the year (congratulations, by the way), he should try to be someone promoting peace and not be argumentative; tone down the tone. It will behoove him to do it. He probably is a very nice guy, but what has been demonstrated seems otherwise. Apologies go a long way. We can all benefit from the harmony we saw happen last night at the meeting. It is a step on the right direction. While there will be disagreements along the way when certain issues come up to CC, let’s hope it stays friendly, as was demonstrated last night. I’m happy for Peter. It’s been a trying year, and this 45-day cooling period could have had a different outcome. With the help of our four city council members and city manager, Peter was able to lead and bring a sense of unity - that was his motto for his term, and I’m glad it ended on a high note. Take the time to get to know someone better. After all, we all live in the same place. I’ve been thinking of other places I’d like to live - and seriously move to - during this contentious time. After last night, it’s here. Let’s hope the goodness continues. I’m keeping my fingers crossed. As long as he has a pair of eyes to see, ears to listen ,and a set of fingers. Making friends with cops, he will know more about you then you could imagine. Not to mention about his group hanging around with Dominic, the city hall has become their house kitchen. Otherwise, how could he realized the Form 700 problems, someone in the city tip him off. It is sad to think that a city clerk making this kind of money cannot properly fill out an FPPC Form 700. How many more incompetent employees in our city? They are coming late and leaving early. At least having 2 hrs lunch are offen. If you have time, sitting at city hall parking lot, you will see it all. They are where to be found on the working Friday. Someone should tip major medias off. Show Time! The police volunteer being referred to has access to information that ordinary citizens are not privy to. He owns a gun store in town and the PD (officers) are purportedly customers of his. Arcadia political activist/Arcadia firearm dealer/Arcadia police volunteer, what a combination! Will I be expecting a Pasadena corruption playing in front of my eyes? He might cost our police department a pricy lawsuit. But you and me have to pay for it. How many more lawsuit city can get now? Sad! FPPC form 700 was stored in city, not police department. Any body can request a copy. No secret for public figures. So the above discussion doesn't make any sense. Are you all new immigrants? Or purposely twisting information to create more misunderstanding? I am afraid it is you who might not understand what is being discussed here, 10:41. The number of hours David Liu claimed as a volunteer exceeds working a 40 hour week. I would like to see a log. It would be public information. Angry fellow and one of Sho's Shobots. Chief Guthrie was supposed to keep David on a short leash. David must have slipped his collar. Refuse to utilive the police vacation check in case it may be David. For their safety Tom Beck and April need to obtain a restraining order. Form 700 is subject to a public records search. On another matter - access to Neighborhood Watch email records was breach for the purpose of promoting the green map for districting. A choice that even Chandler described as "mean". That employee is still in charge of Neighborhood Watch. David Liu is kept on as a police volunteer even though he has created and continues to create discord in the community. Guess rules and ethics do not apply to David Lui. makes one question the police department. His behavior last night should be the last straw for our police. Everyone has some dirt. Looking into his past, it might make your mouth wide opened. A bully? Yes. However he is only a small player in all this. Like a fly on the wall. Only cowards hide behind their past. While Beck was speaking last night, Liu went up on stage to hand in his ‘speaker’ card. Even had the nerve to make hand gestures to Beck. Lazzaretto motioned to a cop to get the nut off the stage. And THAT’s the mentality of a Tay supporter! As I understand it, citizens are not to approach the stage to hand in speaker cards any longer. Is that the case? For safety? I think it was done to keep stalkers at a distance from city officials. Nothing special about David Liu. Just a bit player who needs to puff himself up. This phrase even works in Arcadia, California - Figures lie and liars figure! His childhood filled with difficulty and bully. Growing up in Arcadia as a Chinese is not easy at that time. David's behavior just like the old man grapping the microphone and spoke like the whole world did wrong to him last night. Both people have the hate in their heart. They all believe that they been discriminated. Finally, they have power, they want thier payback time everyday. Definitely a night to remember at Arcadia City Hall. Was a surprise that Mr. Tay stuck with his word that he would apologize at the city council meeting and then stick by his word and do so. Interesting thought tho, Mr. Tay suggested that they set up meetings where the Americans and the Chinese could learn about each others culture. A good idea but, I think if were really trying to be good Americans we would open meetings where we learn about all cultures, black, white brown alike, a multi culture learning center would represent all of Americas diversity. David Liu is highly recommended to go to the class when it added how do not discriminated people's disability. He publically stated giving him a break that talking about candidate's disability is not a hate crime. Let us talking about his obesity problem now. It should not be a hate crime, right? I'm very disappointed at the outcome but understand the council was backed into a corner. That "apology' sounded more like he's sorry he got caught and listed excuses as to why he's not responsible. Also, the concerns about censorship and intimidation are far more serious than the mailer addressed. If he was passed up for mayor, you know he would have his fans disrupt meetings wasting everyone's time. Unfortunately, the precedent has been set that bullying your opponents and creating a smokescreen based on race is acceptable in California politics. Arcadia needs to make sure this doesn't happen again. Perhaps a ballot measure to get At-large elections back is the answer. The first district based election exposed that the move was entirely about helping developers and investors, and not to boost minority participation as stated. 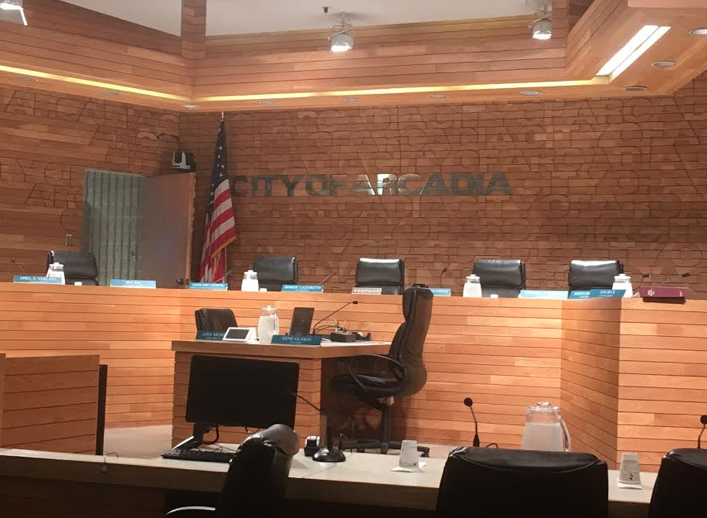 Residents of Arcadia need to take the city back. Ballot measures and lawsuits have worked before. Arcadia’s hands are tied due to Kevin Shenkman, a lawyer who sued a hundred cities (including Arcadia) forcing these cities to go from at-large to districting. I don’t see how a ballot measure will help. I wish it could. Someone close to Sho Tay brought the name of Arcadia up to him. That is why city is in that list. 8:14 - My understanding is Pasadena lawyer Richard McDonald was involved as well. He is often on the side of big developers in the SGV. 10:05, Yes, you are right. Forgot about that attorney. He’s made his appearances at city council meetings. In Sierra Madre his nickname is "Lawsuit Richie." He represents the company that wants to mansionization One Carter. Chinese postcard to attack candidates other than Sho Tay and Roger Chandler? Arcadian's Right protection Association. Who operate ARPA? All need to be looking into. Let's give the council a chance. Quite a staging last night. Stay vigilant. A ballot initiative to set term limits would also be a good idea. Am I the only one who thinks Roger is past his freshness dating? Several people all agreed with you. Term limits. Cross your T's and dot your I's. Thank goodness the correct paperwork was located: Form 700; Schedule A-2 not Schedule - C.
Blogger 6:59 am obviously did not attend Padadena Unified School District during the late 1970's early 1980's when forced bussing was implemented, multi-culture lessons a must. It should including the teaching of attitudes toward to disabled people in Arcadia. From previous blogs I learned to call them "differently abled". Works for me. Redistricting process has nevered worked, it was conceived by dirty politicians for their own power grab. Who Sho agrees with, or what position he is taking, depends on who he spent time with last. Last night it must have been the mythical consultant telling him how to apologize with apologizing. Sho must have paid a steep fee because it worked. I see a pattern. Always blame it on someone else or say "he told me to do it". A man who can't take responsibility. I heard the same thing from Jason the assistant manager at one of the city council meeting. He told an elder that it must be felt off the crack. 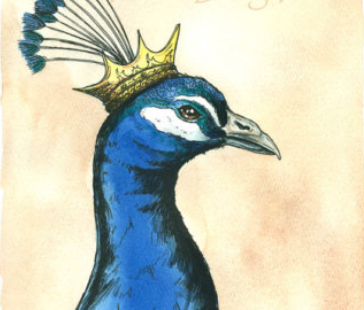 Thank you for the flattering portrayal of peacocks as kings. I find it interesting that April was the only one who addressed the lady who spoke about the frightening robbery at her house. These are the real issues that the city needs to come together and work on. I hope this helps people understand the importance of calling the police if they see something suspicious, their neighbors home being robbed or see a crime. We need more "qualified" women on the council! When I had the need my call to the Arcadia police received quick efficient response. California's current government has and is releasing criminals who then invade our neighborhoods. Be careful how you vote or we will continue more of the same. Be an agent of change by voting for people who promise to change early release policies. April is the example of what make a good council person. A person that listens and responds to the community's needs and problems. She is remarkably transparent, intelligent, and has deep roots in Arcadia. What a relief to have a person with no ties to special interests. You all are clueless. D Liu is Roger's boy! Just because Liu is Chinese, you all think he's Shos boy. Nope.....Roger + David + Susan.....playing you all! Liu is ranting and raving over on his "Voice of Arcadia" site today. Poor guy is taking this stuff personally. David Liu was not even smart enough to verify the charges he filed about April. Turns out he believed a disgruntled employee without checking out her story. Then to top it off he did not check out the difference between a Principal agent and an owner. Nope. Chandler has been financed by developers but he is too smart to trust being connected with David Liu. Small potatoes. Susan who? Last night Sho Tay blamed his lies on a "consultant" yet Sho Tay's FPPC forms do not list any payments to a consultant. So that should be reported to the FPPC. Maybe it was his dog. Maybe he just put it on the wrong page? Nope. Lisa M is in his corner and she would have bailed him out. She gets paid alot to keep track. Somehow she "forgot" to check April's forms. Not nice. Lisa is watching after Sho Tay closely. She often bring him paper to be corrected. They also on the phone quite often. I heard them. Maybe it was the Peacock. They think they're all that. Last night was carefully staged. The apology was a non apology. Beck finally forced a weak confession from Sho that he had "really" done a bad deed after all. Blamed it on a consultant. Another blogger found it interesting that the consultant fee would need to be listed on Sho's required reporting forms. No problem. Sho's friend Lisa will take care of it for him. Let's stand behind April, Tom, and Peter. We have important issues coming up that will make the blood of the developers and the special fire breathing torch bearers boil. Then what? Let's hope April, Beck, and Peter have their courage on. They lacked courage last night. Agreed! 3 to 2 votes what were they scaring about? The 3 will be end up given in. Specially, they already have most of city employees in their package. Bye bye, Arcadia. What else should we expect from Tay by him blaming a consultant? This man really lacks intelligence. His dog ate his "I'm Sorry" speech. It must have had an empty taste. Nice of us taxpayers to pay for Arcadia city employees to take shuttle to/from Arcadia Goldline station and City Hall. Plus, the $600 per month car allowance Domonic and 10 others receive. The hidden perks of working for the City of Arcadia need to come out before they impose a sales tax due to the pensions they’ve given out. From what I heard during the meeting last night was there was a difference between Sho and others council member regarding police pay. The council just concluded negotiating with the city unions (staff, PD, Fire), what did they give away? One of coffee with Mayor (It is possibly in May.) Peter mentioned a 2 percent increase in salary for city staffs. Councils feel Dominic is doing a good job. So they give to him 2 percent, too. Dominic did not ask for raise. It is just fair according to Peter. It was about the pay of ALL employees -not just the police. When compared to other cities many employees are grossly overpaid. Not sure about what they gave away but know for sure that it added $$$ to the $130 million unfunded liability. Next step strike fear into the the people of Arcadia to get them to vote in more and more and more taxes. on the financial situation, especially regarding the $130M unfunded liability. But then the Zoning Code Committee came up with recommendations many of which were ignored by Chandler, Sho Tay, and Segal. It is true that Beck, April, and Peter have a different mind set regarding fiscal responsibility. None of the 3 are beholden to special interests. Increasing taxes without cuts is foolish. Many padded excesses in proposed future expenditures. Gromans Chinese Theater will dim their lights tonight, the last surviving member of the Wizard of OZ Munchkin Lollipop Gang passed away, he wa 98 years old. There is only one city employee take greenline from goldline to city hall everyday. The transportation director. She has to support her own program. I wish she would take red and blueline every day to have her lunch. That will increase the ridership. Our mayor should support the fixed routes by taking his taste of town people on fixed routes instead of the DAR services. The greenline bus stop is right in front of community center. The transportation director has been ineffective in resolving issues with Arcadia Transit and the needs of the seniors and disabled. Seems to be some kind of hidden agenda. Down to one bus to serve those needs regarding the summer concerts. 32 Million Dollars spent for the Governor's seat in California for 3rd place Anthony Villaragosa. Glad to hear that money does not always win. Listen up Arcadia. Developers may have the money but we, as residents, can make the choice for reasonable development. Support Peter, Tom. and April. Development is good for our city but it needs to be reasonable. Why can he use the money to help homeless people? More people may vote him in instead. Two coyotes appeared near to John Wuo's house around midnight last night. It is not a joke. They wanted to borrow a couple of Gem Coins.